The commandant of the US Marine Corps, Gen. Robert Neller, has warned acting Secretary of Defense Patrick Shanahan that a series of "unplanned and unbudgeted" tasks -- including President Donald Trump's decisions to deploy Marines to the southern border and to reallocate a portion of the defense budget to pay for the construction of a border wall -- has imposed an "unacceptable risk to Marine Corps combat readiness and solvency." 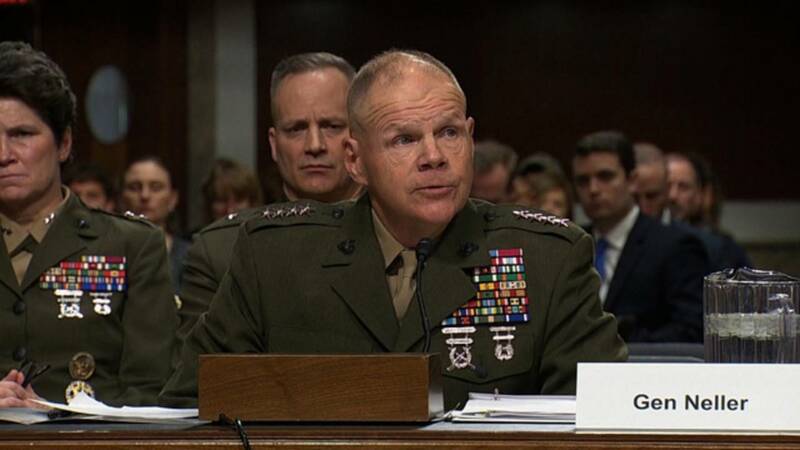 Neller's warning came in a memo dated Monday that says the "unplanned and unbudgeted factors" have forced the Marines to cancel or reduce their involvement in several military exercises. Though the border deployments were cited, hurricane relief efforts were by far the costliest unplanned task, at some $3.5 billion, according to Neller. "The overall impacts of these cancellations and expected cancellations will result in three extremely negative impacts to the joint force," Neller wrote, saying those impacts would undermine efforts to maintain combat readiness, strengthen partnerships with allies and maintain solvency. "Marines will not participate in exercises in Indonesia, Scotland, and Mongolia, and will reduce participation in exercises with Australia and the Republic of Korea at a time where we are attempting to double down on strengthening alliances and attracting new partners," he added. Dealing with the damage done to facilities by Hurricanes Florence and Michael as well as "unplanned/unbudgeted Southwest border operations" and "border security funding transfers" are three of the nine factors listed in the memo that Neller says are undermining readiness. The contents of the memo were first reported by the Los Angeles Times. The memo asks Shanahan for his support in obtaining hundreds of millions in dollars in extra money for 2019 to help offset these shortfalls. By seeking to reprogram some $2.5 billion in defense dollars to support the construction of a border wall, the Trump administration has limited the amount that could be reprogrammed to help meet the Marine Corps' needs. In a separate memo to Secretary of the Navy Richard Spencer, Neller says his ability to reprogram money from the budget to help pay for hurricane relief "will now be limited" due to the "emerging plan for Departmental reprogramming for priorities," adding that this limit means hurricane work will have to be stopped in May. The cost of deploying active duty troops to the border was approximately $130 million as of January 1, but the Pentagon has yet to produce new estimates since the mission was indefinitely extended. Senior Army officials said earlier this month that the Army was using operations and maintenance funds to pay for the deployment of soldiers to the border. Army Lt. Gen. Thomas Horlander said the costs were "not staggering to the point where, you know, it's -- it's hurting our readiness, but it could."